The latest news and information from EGS, including updates on our excursion and lecture programmes, and any other news we think you might find interesting or useful. Please let us know of anything important that we could share with others, by email or using our Contact Form. 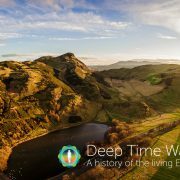 The Edinburgh Geological Society is delighted to be contributing to this year’s Science Festival with a unique event in Holyrood Park, exploring deep time, in association with the team behind the award-winning Deep Time Walk mobile app. Join us in the Deep Time Walk to travel across Earth’s 4.6 billion year timeline at a rate of one million years per metre. Starting at the creation of Earth, the walk covers significant events in history, including the formation of the Moon, plate tectonics, the early evolution of life, dinosaurs and much more. 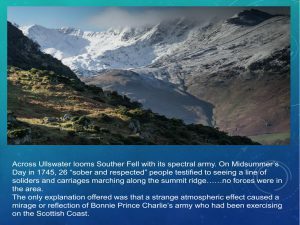 Download the award-winning Deep Time Walk app at deeptimewalk.org. Buy the Deep Time Cards direct from EGS – a set of 58 beautifully illustrated cards, giving 4.6 billion years of Earth history in a tactile, easy to use format. Each card provides a 100-million-year summary of the key transitions that have occurred across Earth’s deep history, with associated reference data and inspiring quotes. 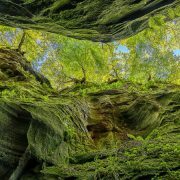 The History of Geology Group of the Geological Society of London and the Edinburgh Geological Society are organising an open meeting, Aspects of the History of Geology in Scotland and the North of England, at Surgeons’ Hall, Nicolson Street, Edinburgh. This meeting will include presentations on Thursday 11 July, followed by a field day on Friday 12 July. 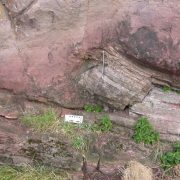 Friday will feature a walking tour of sites linked with the history of geology around the city, such as Hutton’s Section on Salisbury Crags. 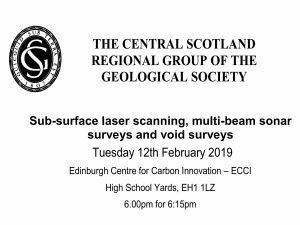 Further details can be viewed at https://historyofgeologygroup.co.uk/scotland meeting. 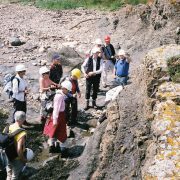 Our bumper Excursion Programme for 2019 allows you to experience the superb range of geology that southern Scotland has to offer. The programme starts on Wednesday 24 April with a short evening excursion around Corstorphine Hill, and runs right the way through to 20-22 September with the weekend excursion to Stonehaven and Highland Boundary Fault. In between these trips, there will be 16 others Wednesday evening (7-9pm), Saturday (all day) and Introductory excursions for new members (x3). 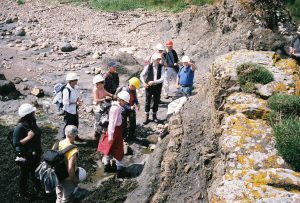 Do try and take this opportunity to learn some field geology from our expert leaders. Visit our website page Excursions to find out more details and how to book them. EGS Council is reviewing our five-year Strategy and would welcome views from the membership. 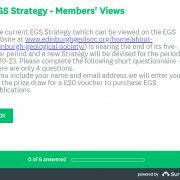 The current strategy for 2015-19 is available online at www.edinburghgeolsoc.org/home/about-edinburgh-geological-society/. Please complete a short online survey (it has only 4 questions) that asks for your feedback on what we do and your ideas for the future. There is a modest prize draw! 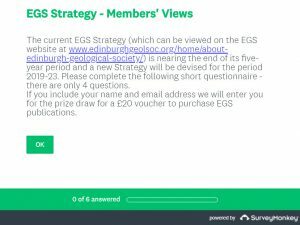 You can find the survey at www.edinburghgeolsoc.org/survey/. Deadline for responses – 31 March 2019. 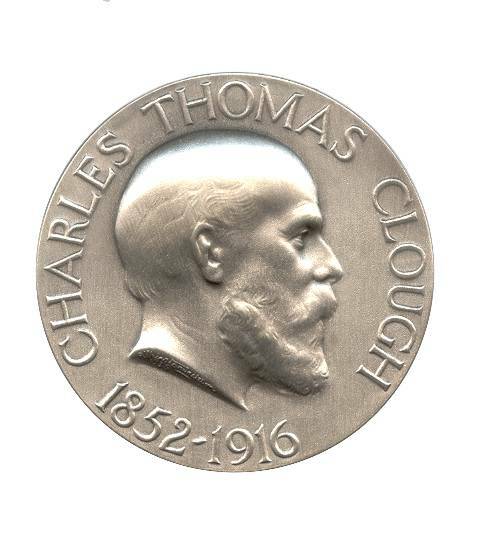 The Clough Medal is presented annually to a geologist whose original work has materially increased the knowledge of the geology of Scotland and/or the North of England, alternatively someone who is Scottish and has significantly advanced the knowledge of any aspect of geology. Find out more about Charles T Clough. This year’s recipient is Dr Tim Dempster from the University of Glasgow School of Geographical & Earth Sciences in recognition of the exceptional contributions he has made to advancing the understanding of the geology of Scotland, particularly the metamorphic geology of the Highlands, where he has employed a wide range of technologies to better understand the processes; and his work as a dedicated and popular teacher of undergraduate students, using the Highlands of Scotland as a ‘natural laboratory’. 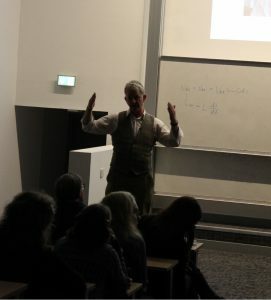 In this joint lecture with the Geological Society of Glasgow Dr Dempster talked about garnets, the workhorse of metamorphic petrologists. Being capable of recording original compositions during growth, garnets allow determination of pressure-temperature paths and durations of metamorphic events. Concentrating on the contact zone between the garnet and its surrounding minerals, a 3D image of the garnet rather than a thin section – which would offer too small an area for clear analysis – was created. 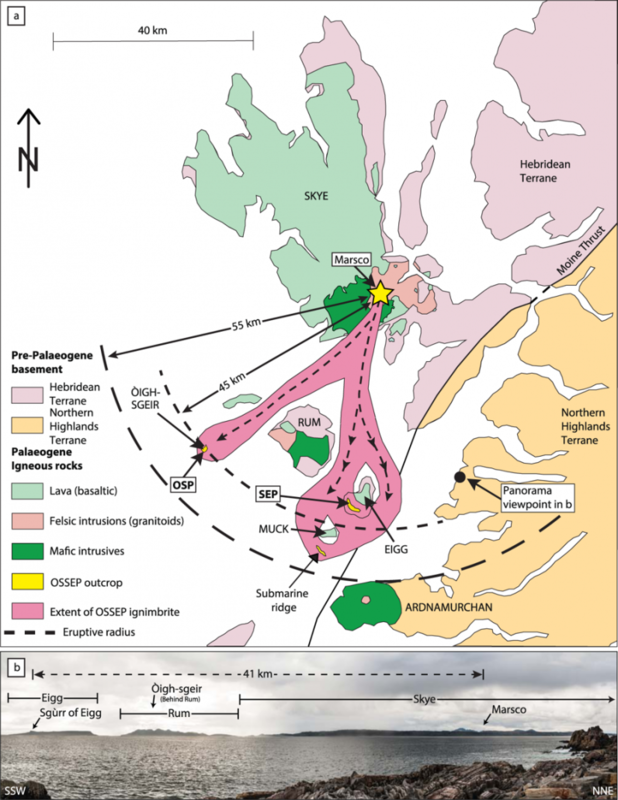 Then the team projected a ‘map’ of the adjacent minerals on the garnet’s surface and variations in its chemistry, e.g. the Calcium content, were recorded. This way of analysing the garnet showed that the crystal’s growth itself can change the chemistry of the surrounding matrix and hence the reaction path during growth, leading to a ‘false’ temperature recording. 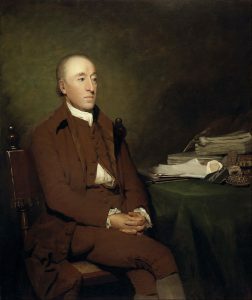 Dr Dempster’s studies of garnets from the Scottish Highlands therefore question some key concepts of metamorphic equilibrium. 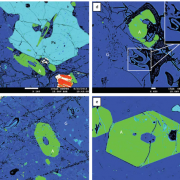 Background reading: Dempster, T. J., La Piazza, J., Taylor, A. G., Beaudoin, N. and Chung, P. (2017) Chemical and textural equilibration of garnet during amphibolitefacies metamorphism: The influence of coupled dissolution-reprecipitation. Journal of Metamorphic Geology, 35, 1111-1130. 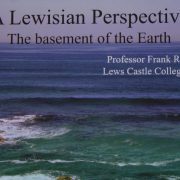 2018 EGS Public Lecture – What the Ice Age ever do for us? Thanks again to all who contributed to this year’s successful 2018 Public Lecture. 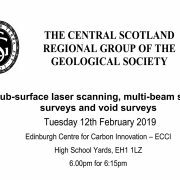 https://www.edinburghgeolsoc.org/egs/wp-content/uploads/2018/12/landscape-carol-cotterill2.jpg 450 600 Neil Mackenzie https://www.edinburghgeolsoc.org/egs/wp-content/uploads/2017/01/Edinburgh_Geological_Society_Logo_White_Slogan-1.png Neil Mackenzie2018-12-31 15:43:292018-12-31 15:44:502018 EGS Public Lecture - What the Ice Age ever do for us? 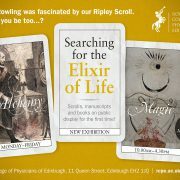 The Royal College of Physicians of Edinburgh is revealing the secrets to finding the Philosophers’ Stone, as part of its new public exhibition – Searching for the Elixir of Life: The mysteries and legacies of Alchemy – which looks at the ancient tradition of alchemy that stretches back thousands of years and was a mysterious early version of science and spiritualism. This is the first time in 337 years that the college’s fascinating collection of alchemical books and manuscripts has been put on public exhibition. 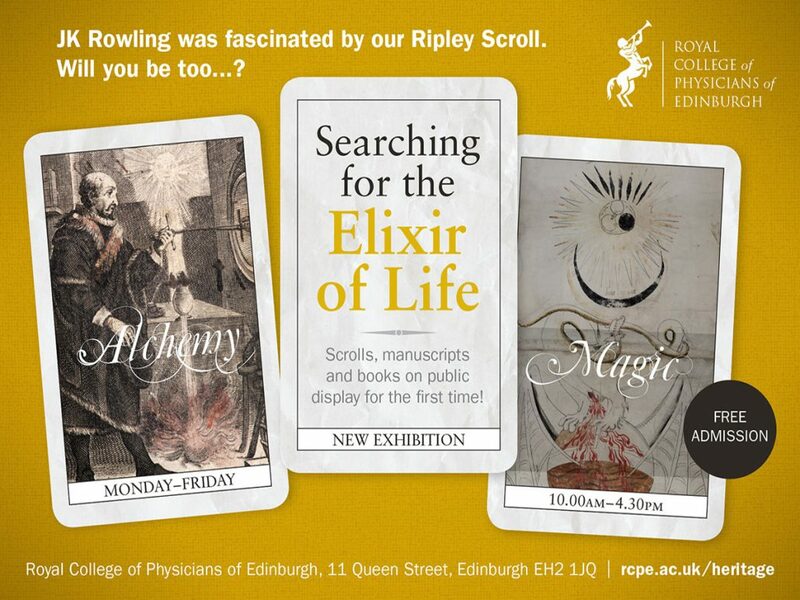 The display will include the College’s Ripley Scroll – one of only 23 surviving copies anywhere in the world, and the only one in Scotland. The scroll uses symbols and illustrations to reveal the steps needed to create the Philosophers’ Stone. The exhibition is free to attend and open to the public from 10am-4.30pm Monday to Friday, until summer 2019, at the Royal College of Physicians of Edinburgh, 9 Queen St, Edinburgh EH2 1JQ. Further information about the exhibition on the Royal College website.